As Greenland Seeks Economic Development, Is Uranium The Way? : Parallels The debate over lifting a ban on uranium extraction pits the Danish territory's lawmakers against environmentalists. It would be a controversial move and one with consequences for Greenland's economic development as well as its political status. 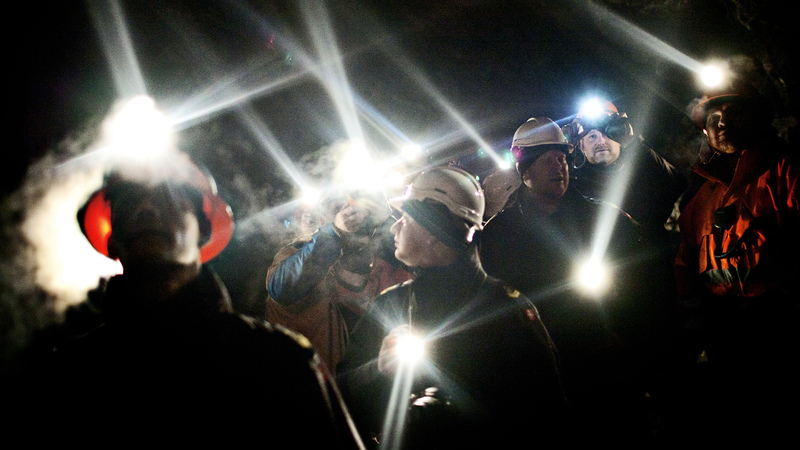 Workers stand inside the gold mine in Greenland's Nulanaq mountain in 2009. The Danish territory's underground wealth was at the forefront of elections in March. Now, Greenland faces another dilemma: whether to end a zero-tolerance policy on uranium extraction. Those minerals include rare earth elements. They are essential to making cellphones, wind turbines, hybrid cars and many other products. China enjoys a near monopoly on the global supply, sparking a race to find new sources of the 17 metals. One particularly large known deposit is in Greenland. But there's a catch. Hanghoj lifts a hefty rock off her desk. It comes from that pink and purple polka-dotted region, though the rock itself is nondescript — except for one shiny black nugget known as steenstrupine. "That mineral has all of the rare earths, or most of the rare earths, but also most of the uranium," Hanghoj says. Uranium would therefore have to mined along with those coveted rare earth minerals. First, Greenland has a ban on uranium extraction. The zero-tolerance policy was put in place 25 years ago when Greenland was more tightly controlled by nuclear-averse Denmark. Since then, Greenland has taken on a new level of self-governance, including jurisdiction over its own natural resources. This month, Greenland's parliament appears likely to lift the zero-tolerance policy. That could open the door for uranium mining not only as a byproduct, but also as a primary product. By some estimates, Greenland has enough of the radioactive stuff to make it one of the top five exporters in the world. It's one thing if we're abolishing a policy, but what is going to be the policy instead of that? And that is something where Denmark and Greenland for the first time in their history really need to start engaging in a discussion that they have not had up to this point. That raises questions for Denmark, which is still responsible for Greenland's foreign policy and security. "The Greenlandic position seems to be that as long as we are exporting for peaceful purposes, then Denmark does not need to be engaged," says Cindy Vestergaard, a senior researcher with the Danish Institute for International Studies. But, she adds, "how will Denmark know it is being used for peaceful purposes if they are not involved? "So it's one thing if we're abolishing a policy, but what is going to be the policy instead of that?" she asks. "And that is something where Denmark and Greenland for the first time in their history really need to start engaging in a discussion that they have not had up to this point." There are also environmental concerns — parallels for which can be seen across the world in projects like the Keystone XL pipeline in the U.S. and Brazil's massive dams in the Amazon. This spring a coalition of 48 nongovernmental organizations from around the world called on Greenland to uphold the zero-tolerance policy, citing the potential for radioactive pollution in a delicate Arctic ecosystem. And members of Greenland's opposition party, like Sara Olsvig, say the public still doesn't really understand the potential consequences of uranium mining. "We have a lot of other choices in Greenland of other minerals, other resources, living and nonliving, that we can export," she says. "And our opinion is that we should go for those other resources instead of rushing through a decision on uranium, not even knowing if it in the long run will pay off. "We don't even know the full picture of what things we would have to build to just monitor a big open pit uranium mine in Greenland." But for others, mining and the economic opportunities it represents cannot come fast enough. Technically, Greenland could declare independence from Denmark at any time. But without new sources of income, it remains tethered to its annual Danish subsidy of roughly half a billion dollars. "When you can take care of yourself, you have more respect and pride in yourself," says Doris Jakobsen of the ruling Greenlandic party. "The same is true of the Greenlandic people." Jakobsen says that protecting Greenland's environment is her priority, adding that lifting the zero-tolerance policy does not mean uranium mining will necessarily happen. But she's tired of hearing what others say Greenland can and can't do. "I can't accept that Greenland should become a museum," she says. "Those [nongovernmental organizations] also say that it should be forbidden to sell our seals, forbidden to whale, forbidden to extract oil, forbidden to extract uranium. You can't limit everything. Greenland needs economic development." Whatever happens in regard to uranium, this issue has raised the decibel level of discussion about Greenland's future. And if there's one thing both the ruling and opposition parties can agree on, it's that any movement is good if it leads to independence.